The Dodgers dropped a third-consecutive game to the Cardinals, losing Wednesday night’s contest 7-2. It’s the first series loss of the year for the Dodgers, who drop to 8-5 on the year. After a scoreless first, the Cardinals opened the scoring in the bottom of the second. Marcell Ozuna led off with a double and stole third off Kenta Maeda. He scored one pitch later on a fielders’ choice. Meanwhile, the Dodgers kept their trends throughout the series going early on. They didn’t struggle to get runners on against Jack Flaherty, but struggled to do anything with them. Joc Pederson led off the first with a single, but a 14-pitch battle between Flaherty and Justin Turner ended in a double play. Alex Verdugo‘s two-out single in second inning was stranded, and an Austin Barnes leadoff HBP in the third was also stranded. The Cardinals extended their lead in the fourth after a leadoff infield single by Paul DeJong. He went first-to-third on a single by Ozuna, but Verdugo threw Ozuna out as he rounded first. Verdugo also kept DeJong at third on a fly ball, but he scored anyway on a Dexter Fowler two-out single. The Dodgers finally broke through in the sixth inning on a solo dong by Pederson. He came into the game 0 for his last 21 and had two hard-hit balls in this game, so it was good to see him get going. It was also the Dodgers’ first run in the last 18 innings. Maeda did not throw a shutdown inning as the Cards responded in the bottom of the sixth. Paul Goldschmidt led off with a single just out of the reach of Chris Taylor in center. 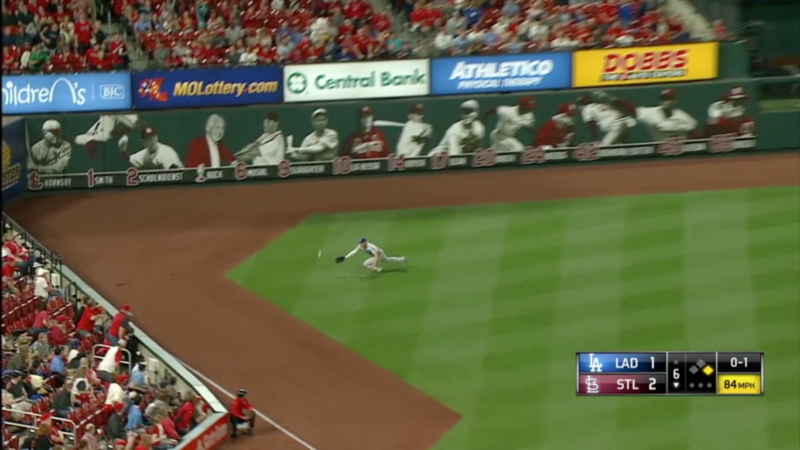 DeJong followed up with a liner to left, which got past a diving Pederson and ended up as an RBI triple. After a strikeout, Maeda gave up a two-run shot to Yadier Molina to end his night. Scott Alexander finished up the sixth. Flaherty was pulled after six innings and gave way to lefty Tyler Webb. Webb got Bellinger, but allowed a solo homer to Muncy to make it 5-2 before being pulled. Dennis Santana pitched a scoreless seventh, but JT Chargois didn’t fare so well in the eighth. He allowed a single, and then Ozuna crushed a ball off the left field foul pole to make it 7-2. Cody Bellinger singled in the ninth, but the Dodgers failed to threaten the five-run lead. Not a great series so far for the Dodgers, who have scored five runs in the first three games of this series combined. They have a chance to avoid a four-game sweep with an early game tomorrow. Walker Buehler starts against Michael Wacha, with first pitch scheduled for 10:15 AM PST.